John recently played a set of tunes at his daughter Nora's wedding. He and Nora then danced the Father/Daughter dance as his son-in-laws played the O'Carolan waltz, Planxty Irwin. Video will be added soon. 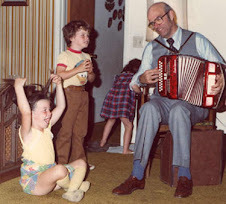 John spent many years playing the accordion for the entertainment of his family and neighbors quite outside of the Irish music scene. Now that the children are raised, he is once again concentrating on his music and hopes to share it with others, in particular the young folks, who might be interested in learning. He currently lives in San Jose, CA.